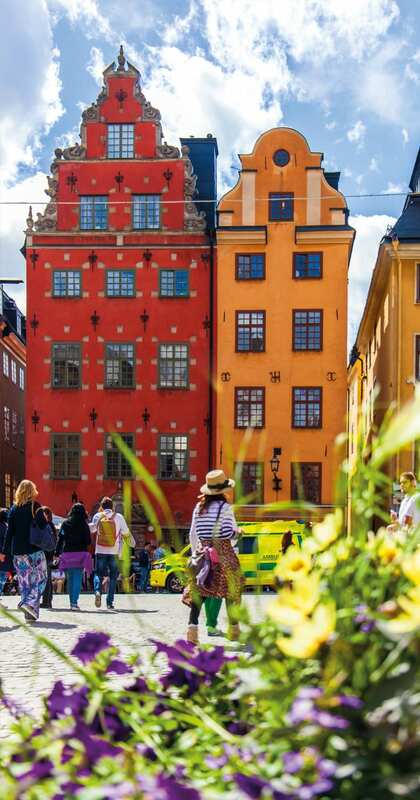 Stockholm is a city that is famous for its high prices, especially in the summer months. The summer, however, is a time when it is well worth visiting. 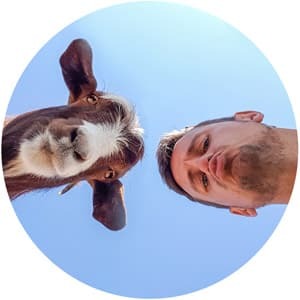 With a little creativity and by latching on to some of its more unique attractions, enjoying a weekend escape here luckily does not need to cost a fortune. I teamed up with Travelex and their new LuxuryForLess search engine to build a weekend away that wouldn’t cost a bomb as well as trying to capture my idea of Luxury experiences in this city…. Accommodation: When booking your hotel you might be shocked at how expensive some of the central options are, but given the fantastic underground and tram networks you can get some great bargains a little further afield. I opted for the Mornington Bromma which comes with a rooftop sauna to ease away the day (you can’t get much more Swedish than that) and at only £50 a night it was a bargain. Book as far in advance as you can if you are visiting during any peak seasons. I always book my accommodation with this website. Not only can you earn gold member status for discounts, but every 10 nights stayed gives you a free bonus night! Getting There: Stockholm actually has four airports, the two main ones for budget airlines are over an hour from the city and will involve an expensive bus transfer so take this into account when booking your flights. If you are planning on discovering some of the other top places to visit in Sweden, you may want to consider flying into Gothenburg or Malmo. 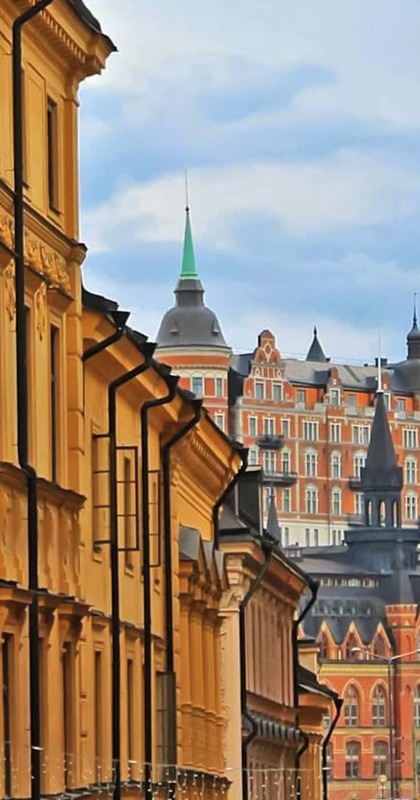 There are usually cheap flights to be found to these cities and you have the bonus of being able to explore more of the country onroute to Stockholm. Eating Out: Stockholm also excels when it comes to food. Great quality, luxury dishes don’t have to mean the top end of fine dining with most restaurants offering a fresh, high standard of food. 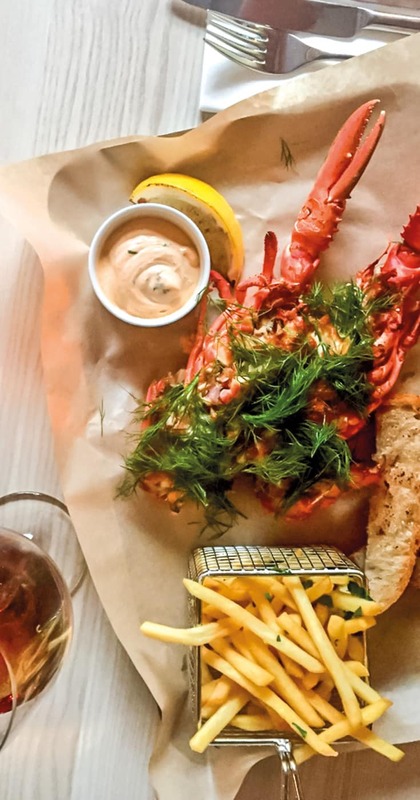 For example, after the Ice Bar, Hearts restaurant next door offers a fresh lobster and chilled glass of wine for £30 which for the nordic capitals is not bad at all. 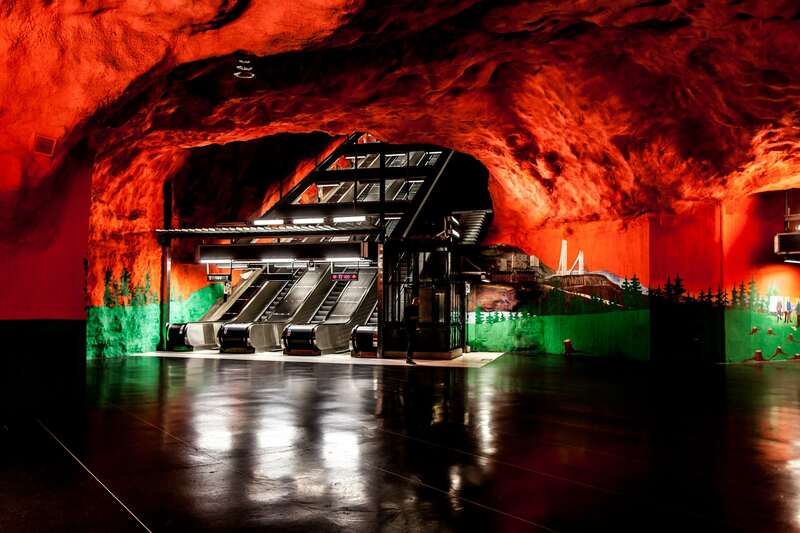 The Underground: When it comes to luxury travel, public transport certainly isn’t the first thing that springs to mind but the maze of carved out underground train lines in Stockholm is a surprise to many. 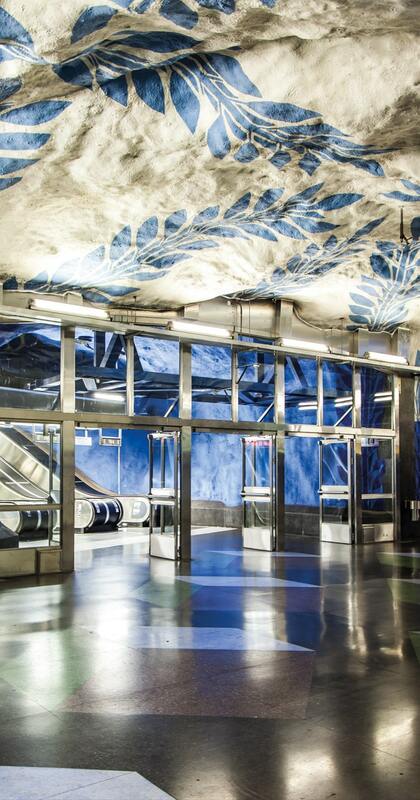 With around 90 stations uniquely decorated and housing a whole range of art and artefacts you can easily spend a few hours making full use of your transport pass to take in this impressive underground world. Brunch with a difference: Brunch is a big deal in Stockholm as is the huge expanse of rivers linking the city. 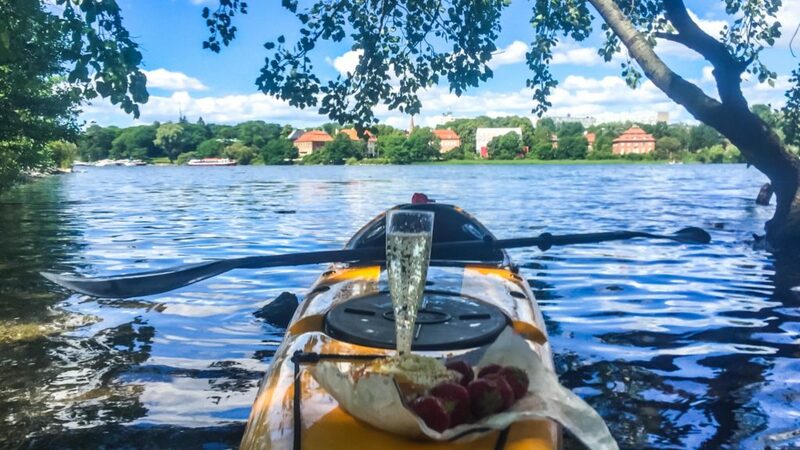 If you want to bridge them both together for a luxury experience which is both different and not as expensive as a top end restaurant grab some local danishes, fresh fruit and a bottle of fizz and head to the Vasa Museum bridge for a Kayak. At around £13 an hour you can take to the water, get a different vantage point of the city and find the perfect spot to relax and brunch all to yourself. 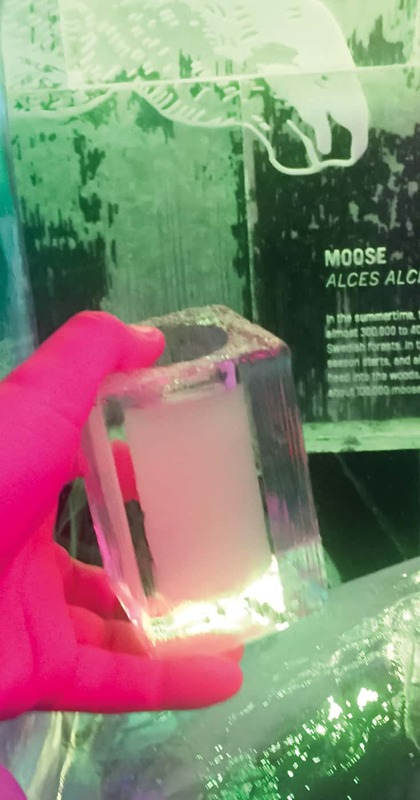 The ICE Bar: Given the temperature of the Nordic region settling in to sip a cocktail at the ICE Bar may seem like freezing madness but this unique attraction, where all the glasses, walls, tables and seats are constructed from ice is a unique stop you can’t miss. With £19 entry including a free cocktail, it is certainly a different way to start the night. Stockholm has heaps of museums and they are actually rather good. 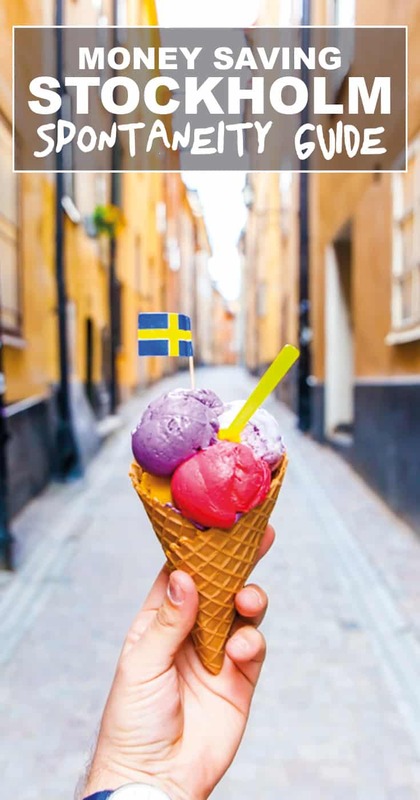 If you are planning to cram as much into your weekend as possible then the Stockholm Card might be a good investment to save some money overall. The Vasa Museum: The warship Vasa sank on its very first journey back in 1628. This huge custom built museum houses a perfect restoration after being found and dug up in 1961. If you are lucky enough to be in town for a themed night you can take a candle lit dinner in the museum itself. The Abba Museum: Well, for a country that has IKEA and ABBA to its name you might want to swing by this bright, loud and energetic museum complete with Karaoke and stages to get your own groove on… Can’t say I am the number one fan but for some this could be the perfect ticket. The Royal Palace: This grand building dating back to the 18th century gives a great insight into the past of the royal family as well as the current monarchy. With over 600 rooms in the palace, it is an architectural wonder. Canal Tour: Whilst I opted to take to the waterways of Stockholm by Kayak for those less energetically inclined taking one of the regular canal cruises is the perfect way to see this city from a river perspective. Fotografiska Museums: As a photographer, I was truly impressed with the extensive collection here, both the permanent displays but also the smaller more modern collections from visiting artists. If you have an interest in the visual arts I highly recommend dropping in here. Gröna Lund Tivoli: This historic theme park is a great bet for families looking to keep the kids entertained for a few hours in the city. 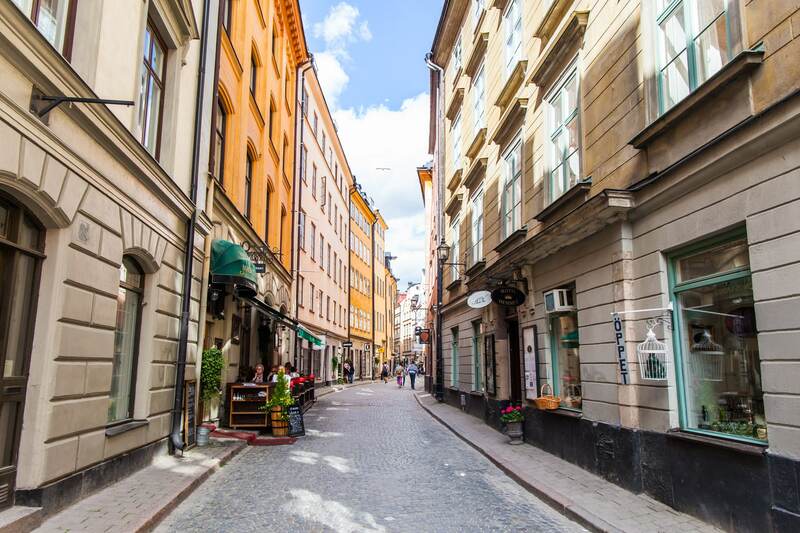 Gamla Stan: The old quarter of Stockholm, Gamla Stan, is a colourful maze of narrow streets, boutique shops and artwork. Taking a stroll from the Royal Palace through to the quaint streets behind is a perfect way to get a feel for this city. Dip into one of the coffee shops to enjoy a Swedish tradition, Fika – literally, to coffee and cake (these guys know how to make cinnamon buns!) before getting your shopping fix on something special. Rooftop Bars: When it comes to rooftop bars you are not left short of choice. For a mid-afternoon weekend glass of fizz, I took to the Scandic rooftop near central station. Enjoy the panoramic views of the boats coming and going and the dark, pointed rooftops as you sink your bubbles without a care in the world. This is a great list of tips. I was actually in Sweden for a week earlier this summer and managed to save quite a bit of money by walking everywhere (in Stockholm, that is), buying groceries, and staying at a hostel further away from the city center. Cheers Danny! It certainly can be done on a budget, a couple of years ago I did the same and was surprised just how much you can save in these cities – certainly helps when it is summer :) Safe travels!